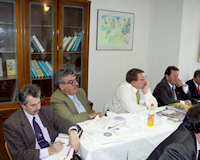 The meeting was held at the IITEA Headquarters in Bucharest, Romania. 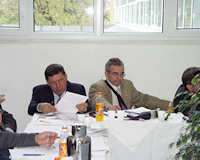 Participants: A. Jorgensen - APIMONDIA President; E. Schieferstein - APIMONDIA Vice-President; M. Peroutka - member of the APIMONDIA Executive Council; Josef Mandík, Czechia; Stefan Stefanov, Bulgaria; Ferenc Graf, Hungary; Peter Bross, Hungary; Josef Èimarik, Slovakia; Marián Kandrík, Slovakia; Tadeusz Sabat, Polonia; Ryszard Palach, Polonia; Marek Slupczyñski, Polonia; Mika Mladenoviæ, Serbia; Desimir Jevtiæ, Serbia; Leonid Bodnarchuk, Ukraine; Victor Lysenko, Ukraine; Arnold Butov, Russia; Igor Krivopalov-Moskvin, Russia; Aurel Mãlaiu, Romania, President of the Romanian Beekeeping Association; Elisei Tarþa, Editor-in-chief, "Apicultural Romania"; Cristian Constantinescu, Managing Director, IITEA APIMONDIA; Marta Giogia, Economic Manager IITEA; Erika Dumitrascu, Editor-in-chief, "Apiacta" Journal. Exchange of EU market data - necessity of such a databank - establishing an Internet port for the IITEA. The price of honey is mainly influenced by four large producing countries : China, Russia, Mexico, and Argentina. As concerns Argentina, 12 years ago the Government started massively subsidizing beekeeping, especially exports. The Argentine Government brought in two men of science from Germany, and went to training the national personnel according to the European standards. The Argentine honey is now as good as the European one. The honey production raised three times, during the last 12 years. All countries importing honey must fight the price established by Argentina. Russia: There are in Russia 3,800 thousand bee colonies, but the existing honey flora could provide for 9 million colonies. The actual production ascends to 0,7 million tons and shall raise to about 4 million tons in three to four years. There are now in Russia 550 thousand beekeepers, 20% of them professionals. 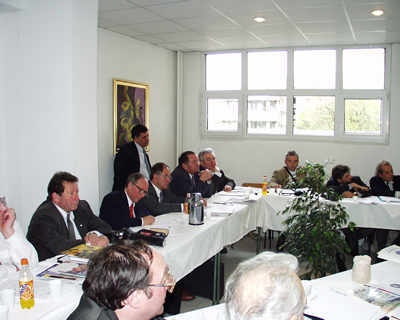 Beekeepers are organized within district, region, and central associations. There are also many intermediate associations. Honey consumption ascends to 500 g per capita. There are 140 stores where beekeeping products are sold. In Cheliabinsk is presently operating the International Apitherapy Center, whose managing director is Dr. Igor Krivopalov-Moskvin. The main diseases dealt with are plate sclerosis and drug addiction. Germany produces anually from 20 to 25 thousand tons of honey, and anually imports 80 thousand tons of honey. The German market is nonetheless very attractive for exporters, as the average consumption reaches over 1 kg of honey per capita. As a result, the German beekeepers should produce much over their possibilities to face the demand. The quality requirements are higher than in other European countries: the water and HMF content should be lower; honey should not contain antibiotic residua, and sulphonamide. German importers should certificate honey does not contain any of the above matters. Practically, the commerce raised the quality lath. Germans are selling honey by themselves (95% of the production). Lowering of consumption is not related to the imported honey but it is owed to the competition of other products: jelly, marmalade, nougat creams. The TV advertising of the same led to lowering the honey consumption. There is a demand of available data concerning the control methods for antibiotics and sulphonamides. A raise is recorded in the trade with honey and supplements: hazel and earth nuts, fruits, etc. There are countries that do not use antibiotics in treating their bees. From 2006 on, there will be prohibited the use of antibiotics as drugs for livestock. Presently, five large companies are operating the food market. If foods would be proven during 6 months in a row to contain antibiotics, they will be banned from sale. Serbia: There are in the country 8,000 beekeepers. The present honey consumption reaches 600 g per capita. Ukraine: They have now 3 million bee colonies, intending to raise this figure to 6 million by 2008. 90% of the beekeepers are private. Czechia: 98% of the beekeepers are members of the Beekeeping Association. The honey consumption reaches 600 g per capita. Over 750,000 bee colones are currently used for pollination services. Participants' arrival. Lodging at "Erbas Hotel"
Morning Participants' arrival. Lodging at "Erbas Hotel". 07:00 pm Buffet-Dinner/Reception at IITEA. 07:00 pm Dinner at restaurant in town for participants who leave Monday.